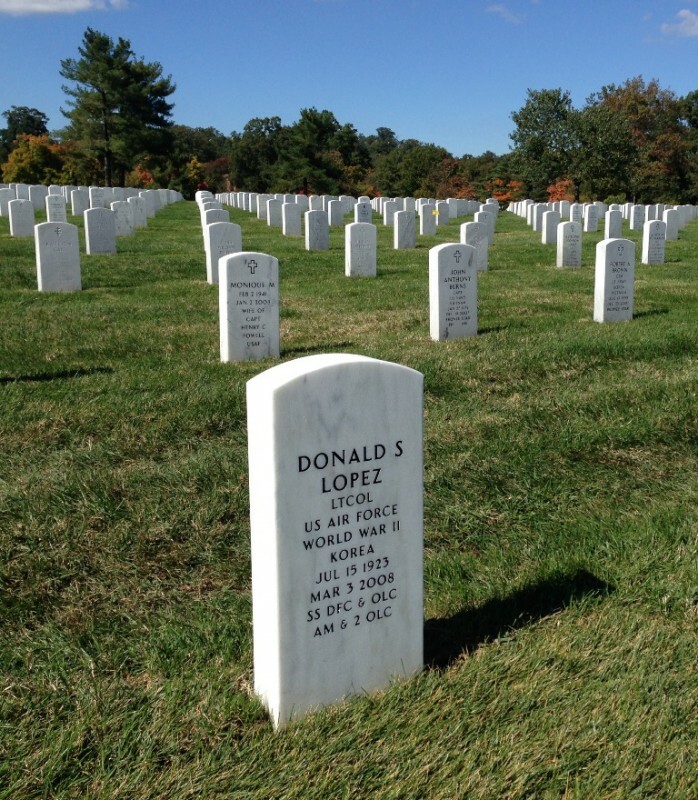 I’ve visited Arlington National Cemetery countless times. 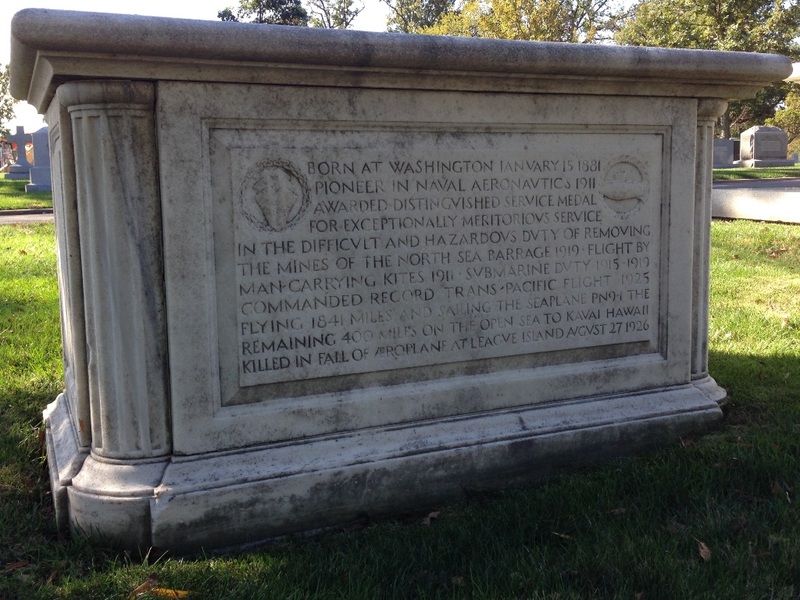 On this day I had a particular mission in mind: to find several gravesites of people I knew or knew of through my work at the National Air and Space Museum. On a cool October morning, I biked the 8½ miles from home to the cemetery. Since you are no longer allowed to use a bicycle to get around the grounds, which cover about a square mile (I’ll spare you a diatribe about that), I locked up at the visitor center and set out on foot. Just that morning, I had downloaded the cemetery’s ANC Explorer app, which helps you pinpoint the location of any gravesite on a satellite image or map. You can create a list of sites you want to visit, and the app will map a route for you through the cemetery’s tangle of roads. Its main drawback is that it doesn’t show your own location as you travel around. At one point I had to consult Google Maps to figure out precisely where I was. But otherwise, it’s an excellent and indispensable tool if you want to explore beyond the most heavily visited areas. 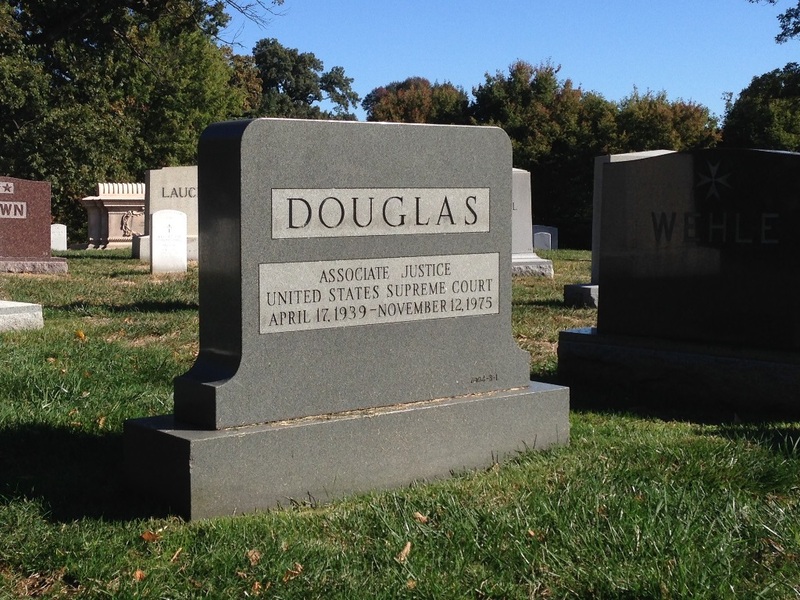 My first stop had nothing to do with the Museum, but when I noticed William O. Douglas on the list of notable graves, I had to seek him out to pay my respect. In 1954 the U.S. Supreme Court justice launched the effort to save the abandoned Chesapeake and Ohio Canal from destruction by leading a group of journalists on a walk down the entire length of the canal, 184.5 miles from Cumberland, Maryland, to Washington, D.C. The C&O Canal eventually became a national historical park. I and generations of others are indebted to him for helping to preserve this national treasure. While strolling through the cemetery a few years ago, I spotted a familiar name. At the time, I was researching and writing Hawaii by Air, an exhibition on the history of air travel to Hawaii, and here I had unexpectedly come across someone I was writing about. In 1925 U.S. Navy Cmdr. John Rodgers led the first attempt to fly to Hawaii. The inscription on his tomb briefly recounts that harrowing flight, which fell some 400 miles short in the mid-Pacific. Rodgers and his crew, given up for lost after an extensive search failed to find them, rigged a sail from their wing fabric and sailed their seaplane the rest of the way to Kauai. An image of the plane is carved into the marble. Rodgers gained widespread fame for that heroic flight. He died in an airplane crash a year later. I also sought out another person I wrote about in Hawaii by Air. In 1918 U.S. Army Maj. Harold Clark made the first airplane flights among the Hawaiian islands. His flight from Oahu to Maui and the Big Island of Hawaii ended with a crash-landing on a forested slope of Mauna Kea. Clark and his copilot survived and reached safety two days later. 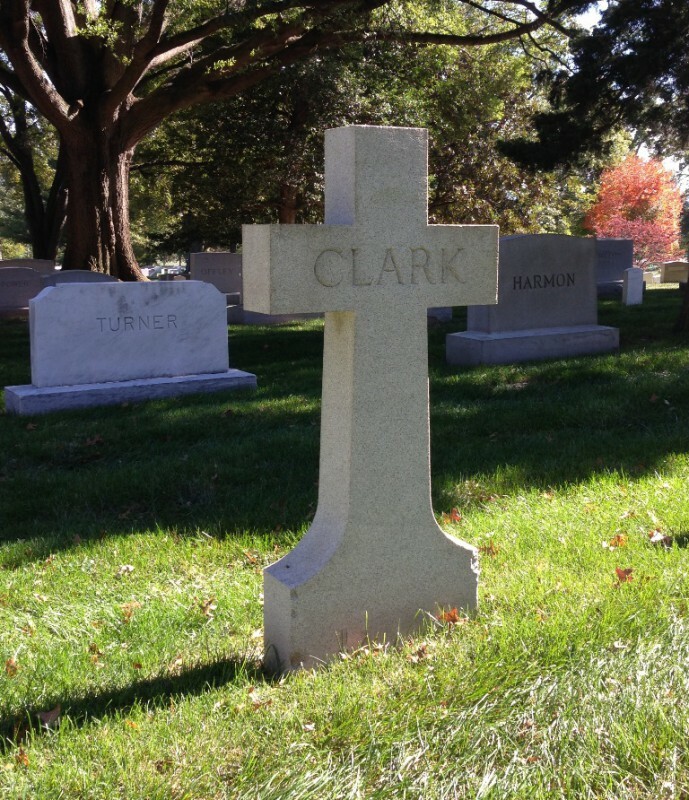 Like John Rodgers, Clark died in a plane crash the following year. Clark Field in the Philippines, which my father helped recapture from the Japanese during World War II, was named in honor of the daring young aviator. On my way to visit Clark, I detoured to find yet another early flyer who met an untimely end. 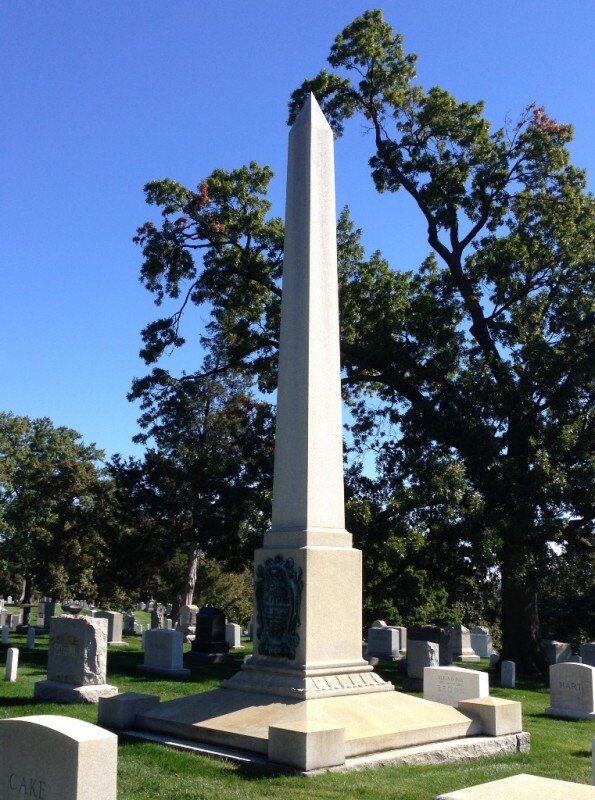 One of the U.S. Army’s first aviators, 1st Lt. Thomas Selfridge flew as an Army observer with Orville Wright in 1908 as Orville demonstrated the Wright brothers’ latest airplane for the Signal Corps at Fort Myer, adjacent to the cemetery. A midair mechanical failure caused the plane to nosedive into the ground, severely injuring both men. Selfridge died a few hours later. He was the first person killed in a crash of a powered airplane. 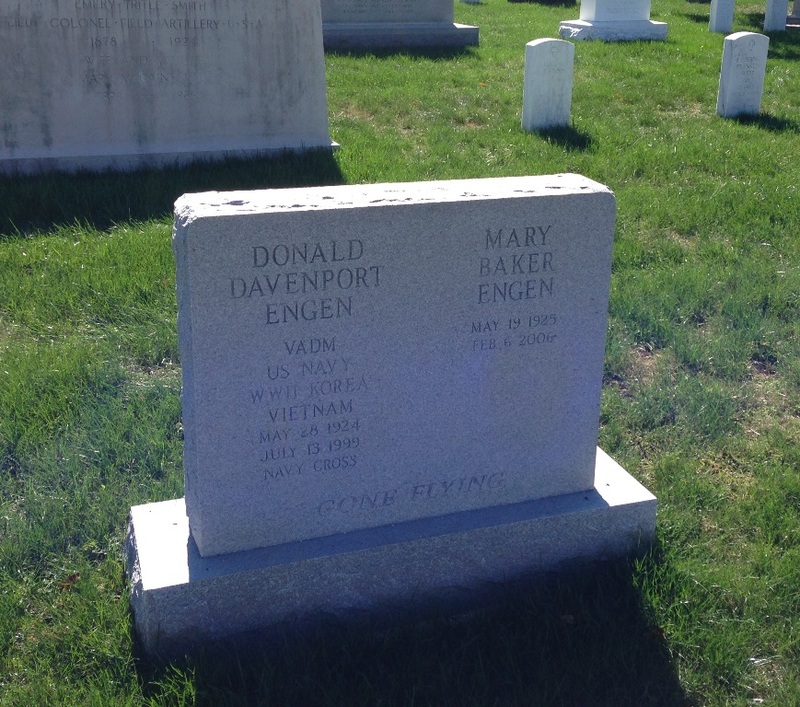 As I climbed the hill to visit Vice Adm. Donald Engen, I heard the crack of rifles nearby and had to step off the road as an empty horse-drawn hearse passed by. A soldier on guard politely requested that I wait a few minutes to proceed until the ceremony ended, one of more than two dozen burials that take place here each weekday. A decorated Navy combat and test pilot and later a federal government administrator, Don became director of the National Air and Space Museum in 1996. Affable and well liked, he guided the Museum past the bitter controversy over its planned exhibition featuring the atomic bomber Enola Gay and launched the effort to build a museum annex near Dulles Airport. One morning when I arrived at work, I heard the shocking news that Don had just been killed in glider accident. A guy whose humor switch was always flipped to the “on” position and who was always armed and ready with a quip, Don Lopez was a beloved presence in the Museum for decades. A combat veteran and test pilot like Don Engen, Lopez was part of the team that planned the new National Air and Space Museum. After it opened in 1976, he served as an assistant director and later as deputy director. When the Museum’s Curtiss P-40 Warhawk was restored, it was given the name Lope’s Hope, after the shark-mouthed pursuit plane Don flew in China during World War II. Lope’s Hope now hangs near the central overlook in the Udvar-Hazy Center. 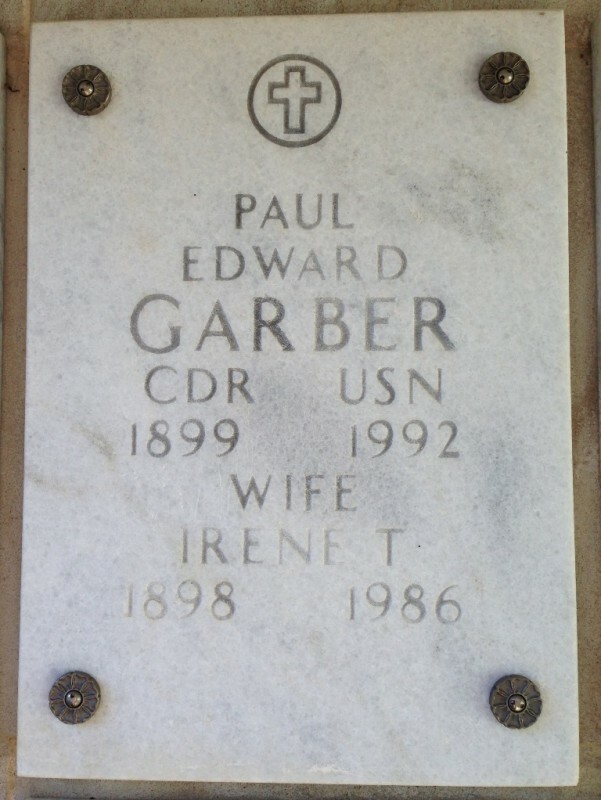 Paul Garber was still a legendary presence at the Museum when I arrived in 1987. I felt a bit intimidated by Mr. Garber (I could never call him Paul), but I soon learned what an amiable and chatty fellow he was. Mr. Garber was a living link to aviation’s earliest days. As a boy in 1909, he witnessed Orville Wright fly the Wright Military Flyer (which now hangs in the Museum) at nearby Fort Myer. He joined the Smithsonian in 1920 and remained associated with it for rest of his life. He became its first aeronautical curator, famously helped acquire Charles Lindbergh’s Spirit of St. Louis, and was instrumental in amassing the greatest collection of historic aircraft in the world. He lived long enough to see Space Shuttles fly. As I stood before Mr. Garber’s niche, I thought of a photo I came across while researching Hawaii by Air. It showed a young Paul Garber with Cmdr. 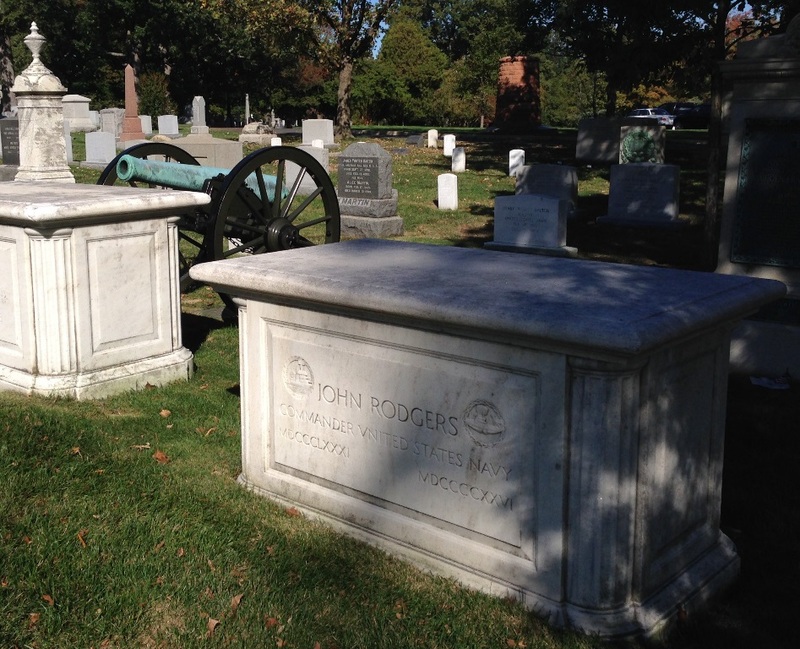 John Rodgers—the two men whose gravesites marked the start and end my tour—legends of aeronautical history and now neighbors in rest. The free ANC Explorer app has a web version and mobile versions for Apple and Android devices. This entry was posted in Local, Virginia, Walking. Bookmark the permalink. Great post, I really enjoyed reading this!